Sorcerers is an unfinished animated fantasy film that would have combined live actors with CG backgrounds and characters in a story inspired by The Three Musketeers by Alexander Dumas. Linden Ashby stars as a janitor (Okay this was done in Virtual Assassin and Nightsiege:Project Shadowchaser II, Enough with the kung fu janitors who used to be secret service agents or something!) who is an ex-secret service agent who protects the swim-team from terrorists looking to nuke the U.S (What terrorists aren't?) and of course our hero wades through the disposable terrorists with the help of a wheelchair bound Rutger Hauer. The cast alone shows promise; Linden Ashby, Rutger Hauer, Thom Mathews and Andrew Divoff. However their efforts are in vain as Pyun never figures out how to use them effectively. Mathews in particular is a good martial artist, so why not have him as one of the henchman, ensuring us a fight sequence between Mathews and Ashby. I mean it would be better then seeing him like a prissy swim coach. Blast however makes the worst mistake of being just plain tedious. 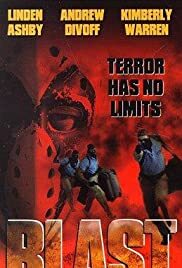 Aside from the ridiculous finale that sees Rutger Hauer as a sword wielding paraplegic, Blast is the worst type of B.movie a brainless bore with no redeeming value. Still, Rutger Hauer's presence saves this from my lowest rating possible.